You’ve created a makerspace. Now what? That’s a typical question from people who have decided to invest in creating a makerspace in their school. There is both real and perceived pressure to fill the space every day with students to show that the space is useful and supportive of student work. But, never fear — there are multiple ways to boost the use of your makerspace over the course of any given day, and I’m going to provide you with some tips to help you jump-start your space. If you want to get students interested in using the space, it is important that the staff is engaged in the space as well. Teachers will be able to assign projects that can be supported by the makerspace if they know what tools are available and how they can be used. 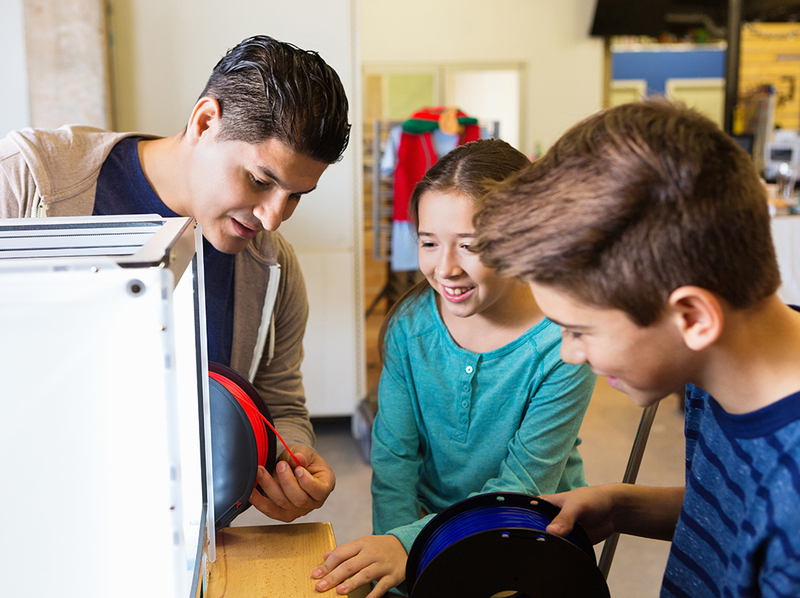 Here are four simple ways to get the staff into your makerspace to see what it’s all about. Professional Development: This is the more traditional way to engage staff in something new and helpful to their class. Give teachers the opportunity to check out the space during professional development time so they can see the new tools and how they are used. Allow them to explore and possibly even make a few things if they are inclined. It is important to give teachers a sense of what is possible in the space for them and for their students. If you have a teacher who is already using the space, team up with him or her to walk others through specific examples to help them fully see what is possible. Makerspace Petting Zoo: This is a small event that can happen before or after school or during lunch. Set up some of the tools in the space and allow teachers to explore during the time frame. 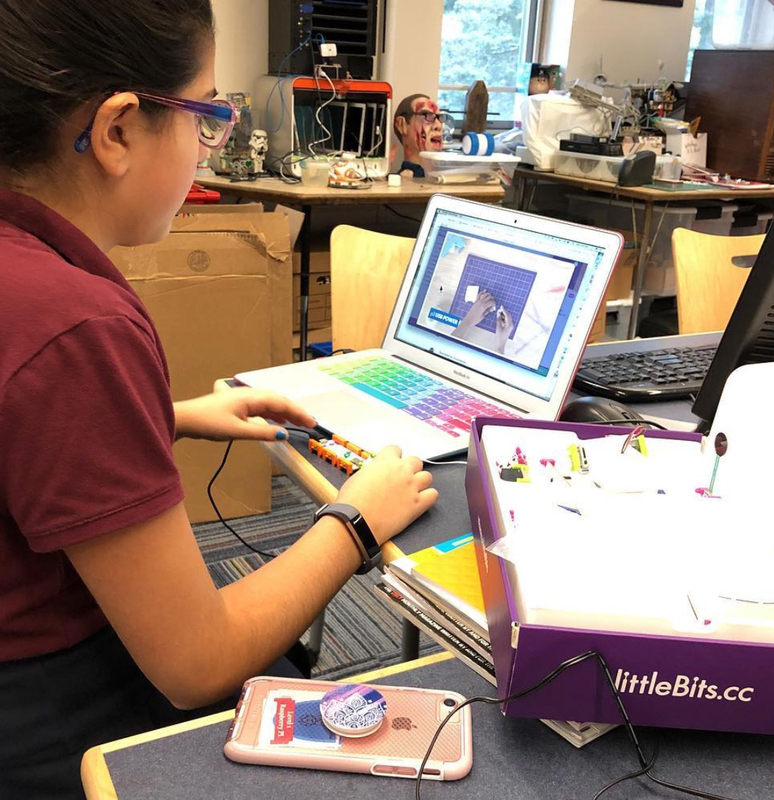 They can come check out the new Dremel 3D45 or see how they might be able to use the littleBits™ Coding Kit to engage students in coding for a math class. Or they could try their hand at some cardboard crafts. Whatever you are going to supply for the petting zoo that day, make sure it’s something short and sweet that teachers can accomplish in a shortened time frame and feel successful. Co-plan/Co-teach: This is a big time investment, but one that is well worth it. Some teachers are hesitant to explore new technology because they are afraid it will mean their entire lesson will bomb. They are afraid the technology won’t work well or that they won’t fully understand how to use it. You can help teachers feel more comfortable by offering to work with them and support their use of the tools in the makerspace. 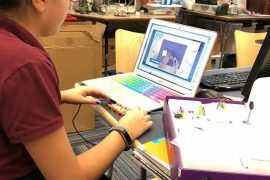 Once they see the tools used with their lesson, they will begin to see how their other lessons can be adapted to allow for more use of the makerspace. Offering to be their wingman will lead to great engagement in the makerspace over the long run. 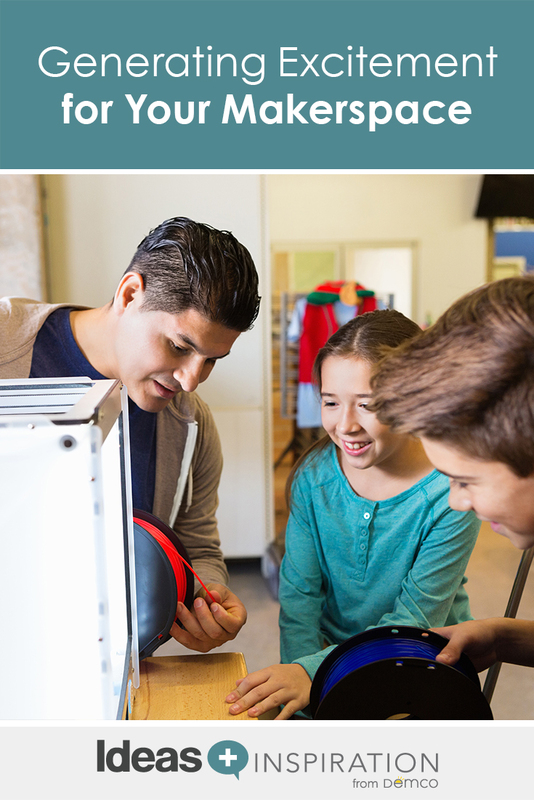 Explore Resources: There are tons of great resources out there worth exploring to help teachers see the value of makerspaces in their lessons plans. Demco’s Ideas and Inspiration site is filled with lessons and tips for makerspaces. It is also worth exploring code.org if you are looking for different ways to engage in coding during the summer months. Kahn Academy is another tool that people have used to help them get a handle on coding for the classroom. Find the resources that work best for you and share them with teachers looking to expand their lessons and skill set. Give students the tools they need to create! Explore project supplies and tools for your makerspace — from crafting to coding, the opportunities are endless. Cardboard Overload: I stumbled upon this by accident. I was accumulating cardboard from all the new purchases I was making to stock the makerspace. There was a huge pile of it in the corner that I was planning to recycle until a sixth grader came in and started to build. He grabbed the duct tape and started building a fort. He invited a friend, who invited another friend, and the next thing I knew, I had a space filled with sixth graders working to create a sprawling fort. I introduced them to Makedo™cardboard tools, and they have been building their fort for most of the year. They are currently looking for ways to add shelving and a video wall to watch YouTube videos. 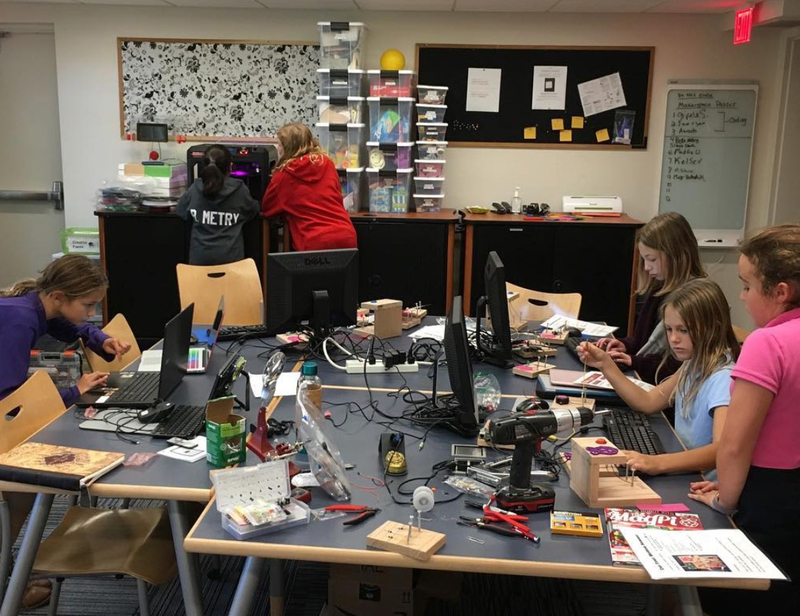 Maker Contest: The first year I built a makerspace at my previous school, I had the “what-if-nobody-uses-it” anxiety that is common for a new makerspace. I thought it would be good to prime the pump a little bit and create a maker contest. I purchased some Raspberry Pi kits and instructed students to form teams of four, identify a problem they see at home or in the community, and use the Pi to solve it. They could use anything they could find around their houses and could not spend more than $50 of their own money on supplies to create their solution. At the end of the month, the students presented their problems and their solutions, and a panel of teachers chose the winning team. The winners were awarded an Amazon gift card and every student group was allowed to keep their Pis (which were originally funded through a grant). Having students in the space working on their projects over the course of a month allowed others to see the space being used and become drawn in, and it allowed staff to see the teaching potential. Ready-to-Go Projects: This one is often a topic of debate in makerspace circles. Some people believe that a makerspace should not have project kits. They think that kits just require following directions and are not truly in the maker spirit of creation. I, on the other hand, believe that these project kits are perfect for introducing different tools to students and staff in a structured way. Everybody approaches making differently. Some need a push to see what is possible, and a project kit can be that push. littleBits kits are perfect for this because they have ready-made projects that come with every kit. I created some project kits with Raspberry Pi that students loved doing, and I also set up a Kano Computer Kit to allow students to explore coding, which they also found engaging. 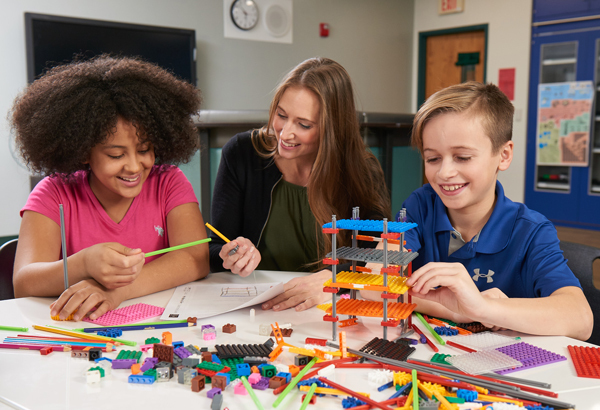 So, choose kits based on feedback from students who are interested in using the space or kits that have increasingly complex projects to help build students’ confidence. You are the expert on your students and staff, so pull from these ideas and put practices in place that best engage them in using the makerspace. Feel free to tweak any of the suggestions listed here or on the Demco Ideas and Inspiration makerspace page — it’s all about what works for you and your users. It may be a long journey to get your space up and running smoothly, but it will be worth it when you do, and putting in the time on the front end will make the back end smooth sailing. If you have any questions or would like to share more tips on engaging your community in your makerspace, do not hesitate to reach out on Twitter at @TheNerdyTeacher and @demco. And make sure to join us for the #DemcoMakerChat on Twitter on Thursday, June 14, at 6 CT/7 ET.